Armstrong is one of those manufacturers that makes a relatively small lineup of products but makes it to the highest standards in the industry. The Armstrong Model 416LT 16 SEER heat pump shows good design and quality craftsmanship, using excellent components in every detail. This model also delivers high efficiency that is Energy Star rated and makes it eligible for the federal energy efficiency tax credit. Jay from Cary, North Carolina offered the Armstrong Model 416LT 16 SEER heat pump price he paid as well as his thoughts on the product. We appreciate all the HVAC prices our readers send. 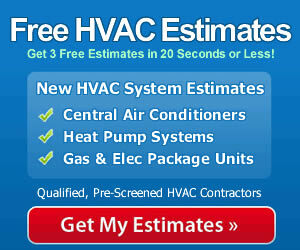 If you have one to pass along, use the form on our Share an HVAC price page. It’s quick and easy! “The last time I considered a heat pump was about 15 years ago when a neighbor got one. It was very inefficient for heating, and the split system was expensive relative to a central air conditioner split system. I couldn’t see the attraction. Two years ago I moved into a home with an American Standard heat pump and air handler, and again, I thought the heating bills were much higher than I’d been paying with a gas furnace. So I planned to replace the whole thing with a traditional central air conditioner and gas furnace. I had several contractors out who gave me bids on the system. The American Standard dealer suggested I take another look at heat pumps since the efficiency has increased quite significantly. I researched them quite a bit on this website and was convinced that with the limited heating we do here that it actually made sense. I didn’t have to replace the air handler and a new heat pump cost thousands less than an air conditioner split system. The efficiency on a gas furnace may still be a bit better, but it would take 15-20 years to make up the difference a split system would have cost. That didn’t make sense to me. It’s definitely worth it to take another look at today’s very efficient heat pumps from top manufacturers like American Standard. Many of them have a lot to offer. Here’s what you get with the Armstrong Model 416LT heat pump. Up to 16 SEER cooling; Up to 8.5 HSPF heating. 2-stage scroll compressor is quiet and energy-efficient because it runs on low to maintain temperature and high to boost heating or cooling as desired. 2-stage operation produces more balanced heating and more effective humidity control. Quiet-Shift technology, discharge muffler, grommet mounts, and the compressor insulating blanket limit operating noise. Uses environmentally safer R-410A refrigerant that is also more efficient. Steel cabinet with louvered side panels are durable and coated with powder paint to resist chips and corrosion. Rounded corners on cabinet are safer. Two-way filter dryer and crankcase heater enhance durability. Onboard diagnostics offers quicker resets and repair. Outside coil dissipates heat quickly. Short-cycle protection and pressures switches maintain optimal operation. Models available from 2 ton/ 24,000 Btuh -5 ton / 60,000 Btuh capacity. When you purchase a high-quality heat pump like the Armstrong Model 416LT 16 SEER heat pump make sure you get all of the performance and efficiency it offers. The best way to do that is to shop for a highly qualified contractor while you’re shopping for the best heat pump prices you can find. You’ll have the best of both worlds when a solid heat pump like this is properly installed and functioning as it should.